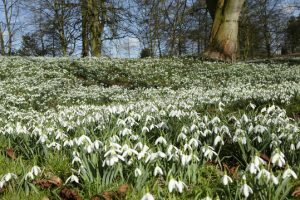 February in the garden is snowdrop time and here at Deene Park the grounds are smothered by an ocean of snowdrops. With even the most modest drift of these exquisite nodding white flowers it’s easy to understand their appeal. Appearing so early in the year, they never fail to lift the spirits and remind us that spring is on its way. Our massed display of naturalised snowdrops is complimented by an ever increasing collection of named cultivars. 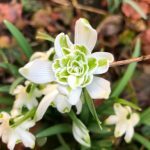 There are several hundred different named snowdrop cultivars, which are identified by the differences in green markings, arrangement and shape of petals; by the way in which the flowers are held; and by the size, shape and colour of foliage. Our collection comprises approximately three dozen cultivars and illustrates nicely the huge range of flower and foliage forms available. 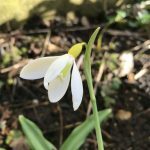 Galanthophiles, as those that are the most ardent fans of snowdrop cultivars are known, can spend many a happy hour on hands and knees admiring named cultivars, or searching naturalised snowdrops for something special or something new. Snowdrops are very easy to grow, given the right conditions and a small clump will soon bulk up in size. Snowdrops enjoy a well-drained spot in light shade, similar to their natural woodland habitat. In the garden, they are ideally suited to planting beneath deciduous trees or shrubs, or amongst herbaceous plants in borders. Under these conditions they will receive the shade that they require throughout the summer and be able to take advantage of the open canopy in February when flowering. Snowdrops are not well suited to spending their lives in pots. Plant snowdrops ‘in-the-green’ in March as they come to the end of flowering, but before the leaves have died down. This helps them establish quickly after they have been planted. After a couple of years, when the clump has bulked up, they can be lifted and divided to create yet more clumps, a process that when repeated over a number of years will soon see your display proliferate. Dry snowdrop bulbs planted in autumn do not establish well. 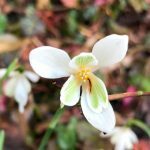 It is perfectly likely that having spent time and money purchasing and planting dry snowdrop bulbs, you may not get a single live plant in spring. On our Snowdrop Sundays we have both naturalised snowdrops and a selection of our named cultivars ‘in-the-green’ for sale, which we lift from the grounds here at Deene Park. 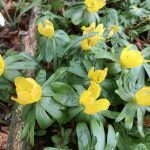 Snowdrops are perfectly complimented by golden winter aconites Eranthis hyemalis and crocus. They can also be combined with flowering deciduous shrubs such as wintersweet Chimonanthus praecox, with richly scented, waxy, butter yellow flowers; or Viburnum x bodnatense ‘Dawn’, smothered in sweetly scented, pale pink blossom. It may be surprising to know that it’s not only flowering plants that are tempted out of hibernation at this time of year. On a warm and sunny day, the gardens at Deene Park hum to the sound of industrious honey bees going about their business. Yes, in February! Planting with bees in mind is worthwhile at any time of year, including winter. A healthy population of these pollinators is so valuable for the wellbeing of our ecosystem. There are a number of plants that are great for bees and great for brightening the garden at this time of year. Snowdrops are one of those plants, as are crocus and winter aconites. 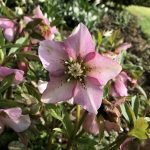 Shade-tolerant perennial Hellebores produce flowers from late winter through to spring and are loved by bees, as are our native primroses. Winter flowering honeysuckle Lonicera fragrantissima, is a bushy, deciduous shrub with highly fragrant, cream flowers in winter and early spring. Another great shrub for bees is the winter box Sarcococca confusa a useful and attractive small evergreen, with glossy, deep green leaves and clusters of tiny white flowers which fill the air around them with their sweet scent for weeks in winter and are followed by shiny black berries. February can be a great month for both the gardener and the bee, with both looking forward to the jewel-like delights of the spring to come.